This wide ear-warmer style headband is great for anyone who loves staying active and outdoors in cool weather. The tapered design is narrow in front and wider around the ears and back of the head. This sort of headband makes a nice alternative to a winter hat. Unlike some hats, the headband fits comfortably under a bicycle helmet or a hood. Crochet a headband for a guy or a girl, choosing a yarn color that suits the recipient. And because they work up so quickly, they make excellent last-minute gifts! Yarn: 60 yards / 28 grams of a worsted weight wool yarn. The sample uses Knit Picks Swish Worsted in Conch. Crochet Hook: Size I / 9 – 5.50 mm crochet hook (adjust as necessary to achieve the correct gauge). Measure your work after crocheting the first 5 rows of the pattern. You should have a square that's about 2-1/4 inches. If it's larger, try using a smaller crochet hook. If it's smaller, try a larger crochet hook. 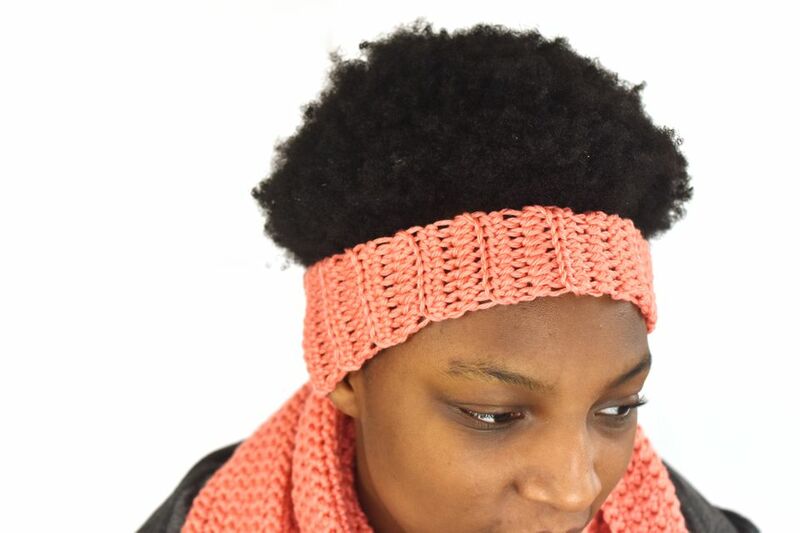 Stitch Variation: This headband pattern uses a variation of half double crochet stitch, in which you work only in the back loops of the stitches. Between each row, ch 2 for the turning chain. The turning chain counts as 1 hdc st throughout. This headband starts in the center front and works towards the center back; then you rotate the work and crochet the mirror image of the first half of the piece. You can avoid weaving in extra ends at the center by dividing the yarn and starting in the middle. Pull out about 30 yards of yarn and wind it into a ball, then start crocheting at that point. If you end up with yarn leftovers, you can put them to use later with some free scrap yarn patterns. Divide the yarn and make the beginning slip knot. Working with the yarn from the small ball ch 10. Row 1: hdc in third ch from hook and each ch across. The first 2 chs in the row count as the first hdc st, giving you a total of 9 hdc sts. Rows 2 – 6: Work hdc through blo in each st. You’ll end up with a total of 9 sts in each row. Row 7: Work hdc through blo in each st. At the end of this row, work 2 hdc sts into the turning chain for a total of 10 sts in the row. Row 8: Work hdc through blo in each st. Total = 10 sts in the row. Row 9: At the end of the row, work 2 hdc sts into the turning chain for a total of 11 sts. Row 10: Work hdc through blo in each st. Total = 11 sts in the row. Row 11: At the end of the row, work 2 hdc sts into the turning chain for a total of 12 sts in the row. Row 12: Work hdc through blo in each st. Total = 12 sts in the row. Row 13: Work half double crochet through blo. Work 2 hdc sts into the turning chain for a total of 13 sts in the row. Row 14: Work hdc through blo in each st. Total = 13 sts in the row. Row 15: At the end of the row, work 2 hdc sts into the turning chain for a total of 14 sts in the row. Rows 16 - 20: Work hdc through blo in each st. Total = 14 sts in each row. If you want to make a larger headband, you can add an extra row, or several rows, here. To make a smaller headband, work fewer rows here. Put a safety pin or stitch marker in the active loop. Row 21: Working with the yarn attached to the skein, pull up a loop and ch 2. Work back across the starting chain, working 1 hdc in the free loop of each st across the row. Total = 9 hdc sts. Rows 22 - 26: Rep rows 2 – 6. Row 27: At the beginning of the row, increase by one stitch. To do this, work 2 hdcs into the bl of the first st. Make your increases this way in this row and throughout the rest of the pattern. After increasing, complete the rest of the row by working hdc in blo of each st in the row. Total = 10 sts. Row 28: Work hdc through blo in each st. Total = 10 sts in the row. Row 29: At the beginning of the row, increase by one stitch. Total = 11 sts in the row. Row 30: Work hdc through blo in each st. Total = 11 sts in the row. Row 31: At the beginning of the row, increase by one stitch. Total = 12 sts in the row. Row 32: Work hdc through blo in each st. Total = 12 sts in the row. Row 33: At the beginning of the row, increase by one stitch. Total = 13 sts in the row. Row 34: Work hdc through blo in each st. Total = 13 sts in the row. Row 35: At the beginning of the row, increase by one stitch. Total = 14 sts in the row. Rows 36 - 40: Work hdc through blo in each st. Total = 14 sts in ea row. If you added any extra rows after row 20 in the first half of the project, be sure to add the same amount of rows at the end here too. Put a safety pin or stitch marker in your active loop. If the headband is not a surprise gift, you can do a quick fitting to make sure the fit is OK. Using safety pins, pin the sides of the headband together and try it on the intended recipient. Make any necessary adjustments before finishing the headband. Hold the two ends of the headband together and join them with slip stitch. You can also use whip stitch or another joining method. Weave in the ends. Optional: If you want to make the upper and lower edges of the headband look neater and more finished, you can add slip stitches all the way across both edges. However, the slip stitches don't stretch much, so it will affect the fit. If you do choose to add the slip stitches, add them before tying off the yarn and work them using a loose, easy tension.